Well another week has passed all we are all back together in the Headmistresses study once more confessing what we've been up to. So first of all I will show you the ATC's that I had made, but blurred the picture last week. Actually, this is a different one because it is clearer than the other one. Then I have to say 'Thank you' to everyone who sent me ATCs, Margaret who is checking my post intermittently says that I have a nice little pile of them at home, and I won't be there to see them until next Monday, but they will be a wonderful surprise when I do get to see them. So as this is about what is on our worktops, I'd better show the only craft I have done in a week. It is my great nephew's 4th birthday next Monday so I had to create something from the very limited selection of materials I had brought with me. He is apparently very keen on pirates so I managed to buy some pirate stickers, and threw them at the page with a number four I cut out. 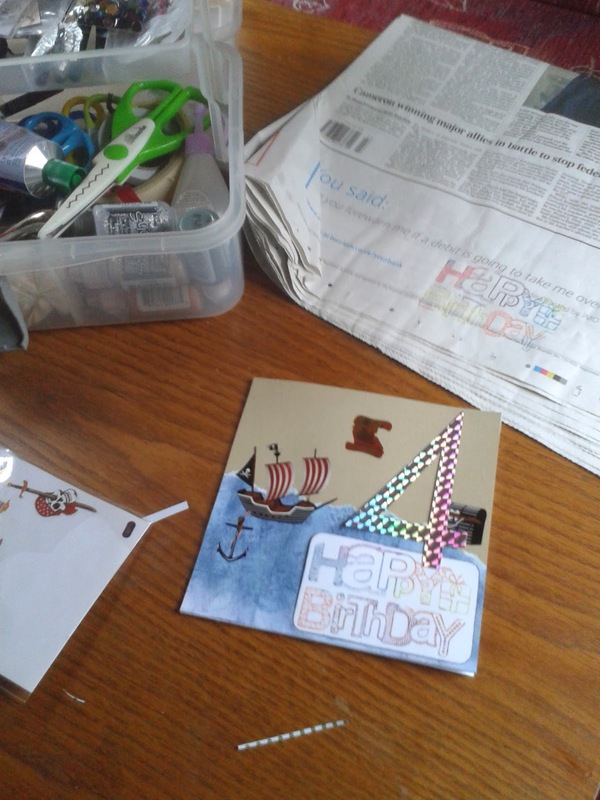 If you look very closely you can see where I tested the Happy Birthday stamp, in multi colours, on the newspaper to make sure it worked. And this is where we stayed Tuesday night. Picture taken before it poured with rain. 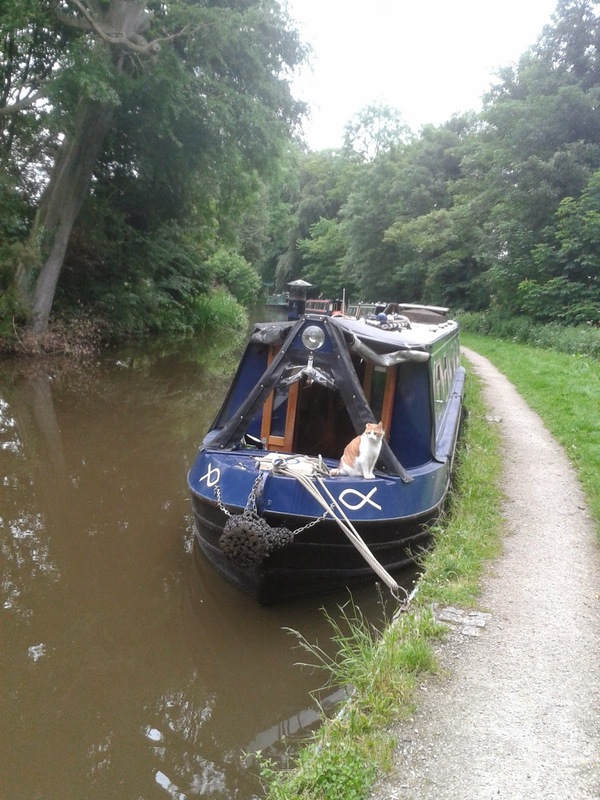 You can see a boat cat on the bow before he leapt off and encountered a dog and returned very quickly. He seems to enjoy himself most of the time on the boat, but does get very cuddly sometime when he is feeling insecure. Well that all for now, not sure how much visiting I am going to be able to do this week, but will do my best to visit all who visit me. Bless you all and have a Happy Wednesday. Max looks very happy there. Bleubeard is quite jealous, because I never take him anywhere (grin). For not having many supplies on the boat, you did a fantastic job. and in my opinion, you are truly living THE life!! 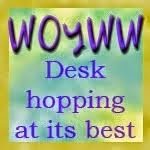 Happy WOYWW and thanks for your previous visit. I'm impressed that Max goes with you - but I suppose he must be used to it. My two would go AWOL, I'm sure! I love your sparkly ATCs...completely gorgoeous! Those ATCs look lovely! I know how organised you have to be to take craft supplies on a boat. That's a great pic with your kitty sitting outside. Evening, Chris. What lovely ATCs you made. Enjoy looking at all your received ones next Monday!!! Proper little boat cat now, isn't he? Well done Max - you've got the idea. I am so jealous, what a life. The cat obviously loves it too. I bet there are all kinds of adventures for him when you stop for the night. Love the collection of ATCs too. Wow, wonderful ATCs and all so different! What a cute travelling companion!